The Green Bay Packers announced today that they have slapped the franchise tag on nose tackle Ryan Pickett, which will give the 30-year old run stuffer a one-year contract worth just over $7 million. The franchise tag is calculated by averaging the top five salaries of the highest paid players at each position, which for a nose tackle came out to $7.003 million. Pickett becomes the third nose tackle to have the tag placed on him, joining the Patriots’ Vince Wilfork and the 49ers’ Aubryao Franklin. Steelers’ nose tackle Casey Hampton is also expected to have the franchise tag placed on him by Thursday. With the NFL Combine just days away and the free agency period yet to begin, I decided to do something a little different in terms of a more feature-oriented article. Everyone knows the Green Bay Packers are one of the top organizations in the NFL. With boatloads of young talent, fearless leaders, and a wise coaching staff, they are truly one of the best. And that is the theme today: best. Best Mismatch: Jermichael Finley – This award was basically made for Finley, who is arguably the best mismatch in all of football. The Antonio Gates comparisons are right on target and Finley could distinguish himself as the best tight end in the NFC next season. He is too fast to be covered by linebackers and his size makes it so that cornerbacks have a world of trouble on balls throw high. If there’s a way to stop him, defensive coordinators would sure like to know it. Best offensive player: Aaron Rodgers – It’s hard not to vote for Rodgers despite all the great weapons he has around him. The reality of it all is that the Packers’ offense lives and dies with Rodgers, who is quietly becoming one of the league’s best passers. His pinpoint accuracy and smart decision-making are two of the reasons he is the best. Over the course of the fantasy season, I will be answering any questions you may have concerning player’s minutes, injuries, or who hot free agents are. Feel free to e-mail me at Mark.Strotman@Marquette.edu if you have any questions, and every week I will compile them and answer them all. For this week, I started things off myself with a question all owners seem to want to know. With Don Nelson’s erratic lineup changes and substitution patterns, which Golden State Warriors can we count on the rest of the season? Despite the Warriors’ fast paced attack on offense, Don Nelson’s substitution patterns combined with injuries have made the whole Golden State lineup a question mark. Moving forward towards the rest of the regular season and the fantasy playoffs, the only true safe bets are Monta Ellis and the surging Stephen Curry. Heading into the 2010 NFL Draft, one position the Packers will look to improve is cornerback. The Packers’ defense stepped up as a whole in 2010 but the pass defense struggled at times, culminating in an embarrassing playoff-loss to the Cardinals in which Kurt Warner threw for more touchdowns than incompletions. Injuries decimated the defensive backfield during the season, with Al Harris, Pat Lee, and Will Blackmon all suffering season-ending injuries. This left the Packers with no choice but to scrap up whatever was left in the free agency pool and try to make a run in the playoffs. Josh Bell and Trevor Ford did their best in dime situations, but in the end it’s clear improvements must be made. Age is another concern for the Packers at corner, with their current starters well over 30 years old (Harris is 35 and Charles Woodson is 33). While both are expected to be back next season and playing at a high level, there’s only so long before they start to regress and replacements are needed. The NBA Trade Deadline is three days away, and while rumors have been floating around the league with big names heading to different destinations, two moves have already been made that will have fantasy implications the rest of the season. The Dallas Mavericks made the first blockbuster trade of the season by acquiring Caron Butler, Brendan Haywood, and DeShawn Stevenson from the Washington Wizards in exchange for Josh Howard, Drew Gooden, James Singleton, and Quinton Ross. The Portland Trailblazers also went out and got the guy they wanted in Marcus Camby, and in return the Los Angeles Clippers received Steve Blake and Travis Outlaw. Here’s a breakdown of how each trade affects all four teams involved. To read the rest of this article, click here and read it on Examiner.com completely free! Just as it was last year, the Big East is arguably deepest conference in the nation and will again have a slew of “bubble teams” when Selection Sunday rolls around. With three weeks left until the Big East Tournament in Madison Square Garden, many teams will be fighting for their NCAA dreams with every game that they play. It’s safe to say that the Big East has four locks to make the tournament in Syracuse, Villanova, West Virginia, and Georgetown. At 19-6, the Pittsburgh Panthers are all but in the tournament as well. But outside of the five locks, there are seven Big East teams that can consider themselves “on the bubble” as the home stretch comes into view. To check out predictions on Marquette, Notre Dame, South Florida, and Connecticut, click here. 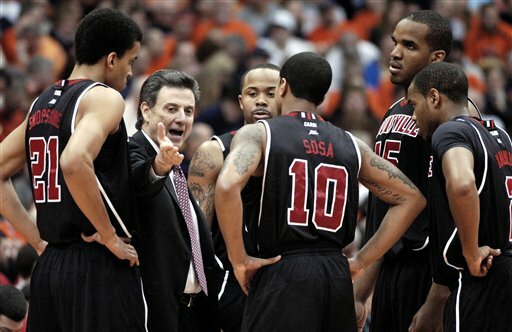 Today’s bubble teams will be Louisville and Cincinnati. Why They’re In: Louisville was sitting on the bubble looking for their signature win before their victory over Syracuse in the Carrier Dome. Now that they have it, the ball is in their court to finish the season strong and enter the tournament on a high note. With a great RPI against one of the toughest schedules in the nation, Louisville’s resume is rounding out very nicely. Why They’re Out: The Cardinals have a couple of bad losses to their name and have also failed to beat other bubble teams in the Big East. A home loss to Western Carolina doesn’t help, and they also stumbled by getting blown out by St. John’s. Playing in Seton Hall is no easy task, but it would have gone a long way in the Big East standings had they won. Outlook: The Syracuse win will be the foundation of Louisville’s season if they make the tournament, and with games against other bubble teams in Notre Dame, Connecticut, and Marquette, as well as two other potential upsets in Georgetown and Syracuse, there are many opportunities for Louisville to make a statement. Why They’re In: Wins over Maryland and Vanderbilt in the Maui Invitational have put Cincinnati, who is just .500 in league play, into the bubble mix this season. They still have some chances later in the season to do some damage and will need to beat a top-5 Big East team. Why They’re Out: The interesting part of Cincinnati’s season is that they have no “bad losses” (RPI above 100) this season, but the problem is they have not defeated any teams in conference and are just 6-6 entering Tuesday. The lack of big wins will be a problem come tourney time, and they have just two opportunities left to make a statement. Big East Bubble Teams: Who’s Getting In Who’s Left Out? Today we’ll take a look at Marquette, Notre Dame, South Florida, and Connecticut followed by Louisville, Cincinnati, and Seton Hall tomorrow. Why They’re In: The Golden Eagles have played some of the best teams in the nation down to the wire and have proved they can hang with the big boys. A big win over Georgetown became Marquette’s signature win of the year and they also took down Xavier in the Old Spice Classic over Thanksgiving. Tough wins on the road against UConn and Providence also look good on the resumé. With their deadly three-point shooting, they are a perfect candidate for pulling off an upset if they get to the tournament. Why They’re Out: They have stayed close with those teams, but losses are losses. Even worse, they have two losses to teams with an RPI outside 100, North Carolina State and Depaul. They have struggled on the road this season, losing their first five away from the Bradley Center before winning their last two. Outside of the Georgetown win at home, there aren’t any other signature wins the Golden Eagles can hang their hats on. Why They’re In: Luke Harangody and the Fighting Irish have outplayed expectations this season and once again find themselves in the thick of things as the season comes to a close. At 6-6 in conference and already at 17 wins, the Irish can play themselves into the tournament with a strong finish. Their win against West Virginia was a necessary victory and a win over Georgetown could really solidify their resumé. Why They’re Out: If the Irish miss the tournament again this year, they will be kicking themselves in the head for their embarrassing home loss to Loyola Marymount back in December. The West Virginia win was big, but it might not be enough to cancel out the LMU loss as well as the loss to Rutgers. They also might be starting to unravel, going 3-5 in their last eight games. Why They’re In: South Florida is one of the more intriguing teams in the Big East because of their recent four-game win streak that saw them defeat Pittsburgh and Georgetown in the span of four days. Their RPI and strength of schedule are helping them out and the return of Gus Gilchrist is a huge boost. 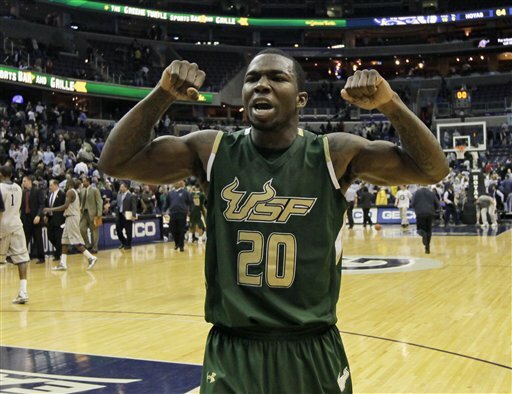 With two very good wins under their belt and a favorable schedule to finish the year, USF could get in. Why They’re Out: Their conference record (5-7) is not too hot even though they have played the top six teams in the conference already. If they don’t jump a few teams in the standings, they could get lost towards the bottom of the Big East. The loss to Central Michigan was also a bad home loss and could come back to haunt them. Why They’re In: Most teams who have just four conference wins at this point and are barely over .500 for the season would not be talking NCAA Tournament, but Jim Calhoun’s squad is still alive at this point. A win over then-No. 1 Texas is definitely the focal point of Connecticut’s resume, as well as the fact that they have played the fourth toughest schedule in the nation, including Duke, Kentucky, and their Big East foes. Why They’re Out: Simply put, they just haven’t won games. Outside of the loss to Michigan, they haven’t had a bad loss that would burst their bubble, but they have failed to win games against other bubble teams (Marquette, Louisville, Cincinnati x 2) and that will hurt them in the end. The best they can finish is 10-8 in the conference, and that would include wins over Villanova and West Virginia. Mark Strotman is currently a sophomore at Marquette University, majoring in journalism. He has a Monday morning radio show and plans to work for the school newspaper, the Marquette Tribune, this year. He has his own blog that can be found at strotty.wordpress.com and writes for BleacherReport.com, FanHuddle.com, and ESPNMilwaukee.com. His work has been featured on CBSsports.com, Charlie Villanueva’s Twitter, and PackerChatters.com among other sites. Win or lose, you’ll get the best Packers analysis around from him as he looks forward to sharing his knowledge and opinions with you and hopes you do the same. This Sunday, Atlanta Hawks forward Josh Smith and Utah Jazz forward Carlos Boozer will watch the 2010 NBA All Star Game from the stands instead of the bench. Can anyone explain how this is possible? Let’s be honest, snubs happen every single year in every sport’s all star game because there are too many good players and not enough good spots. This happens especially in the NBA, where there are just 12 spots to go around so for the most part I let the “snub argument” pass. However, the 2010 NBA All Star Game will feature four fill-in players due to injuries to Chris Paul, Brandon Roy, and Kobe Bryant in the West and Allen Iverson in the East, who will miss the game due to an illness to his daughter. It’s one thing to not vote in either Smith or Boozer, but to then say Smith wasn’t the best player left off the roster or that Boozer wasn’t even the THIRD best player left off the initial team is ludicrous. Starting in the East, Iverson was replaced on the roster by David Lee, which was the right move. Lee is having an incredible season and deserved to be in the game, regardless of how badly the Knicks have played. 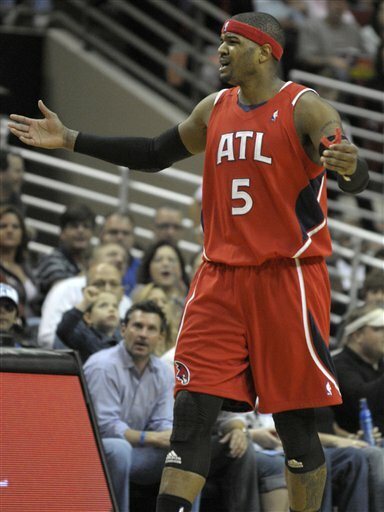 The real issue with the East’s roster is that they selected the wrong Atlanta Hawks player. Al Horford will be making his first All Star appearance of his career, a decision that is head scratching to say the least. Comparing Horford with Smith, it’s hard to come up with an argument that Horford deserves to be in the game more. Smith is averaging better stats in these categories: points, steals, blocks, assists, assist-to-turnover, doing so while averaging a minute less than Horford. Horford has a one-rebound advantage on Smith and commits less turnovers, but Smith averages over eight rebounds and only turns the ball over two times a game, so it’s not as if he lost his All Star vote because of those numbers. The Hawks are 33-18 at the break and sit just one and a half games behind the division-leading Magic, thanks in large part to Horford, Smith, and the silent assassin Joe Johnson. But when someone thinks about the Hawks, most think first of Smith’s high-flying dunks and deadly defense before they think of the blue-collar, hard-working Horford. The All Star Game is all about flashiness and if there is one player who defines that, it’s Smith. He has one of the most intriguing styles of play in all of basketball that includes a jump shot, post moves, above-the-rim potential, stingy defense, and the potential to swat a shot on any possession. To keep that out of the All Star Game just because Horford is a center is a crime. Josh Smith deserves to play in the game. More baffling than Smith’s All Star snub is the fact that Carlos Boozer was left off the team when the original rosters came out, and then we watched as three more players were selected over him as replacements. The first was Chauncey Billups, who was rightfully put into the game after putting together one of the best seasons of his career. Jason Kidd was also selected as a replacement, and as hard as it is to think of him as an All Star, the game is being played in Dallas so he will get to play in front of his hometown fans and he also didn’t have to fly into the winter storms that have hit Dallas. The real beef with not having Boozer in the All Star Game this Sunday is the fact that Chris Kaman was selected as a replacement over him. Just as it was with Smith and Horford, let’s compare the two West forwards and try to make sense of this all. Boozer, who missed three games early in the season, is averaging more rebounds, steals, assists, and has a better field goal percentage. He is behind Kaman by less than a point per game and, while Kaman averages over a block per game, Boozer is one heck of a defender. While the stats match up more closely than Smith/Horford, the real problem here is that Boozer has led his team to one of the best records in the conference, while Kaman has his Clippers destined for yet another lottery in June. Whether the NBA admits they take team records into consideration or not when they make their selections, it’s clear they do (why didn’t David Lee get in the first time around?). The Clippers are 19 games back of the Lakers, while the Jazz finished the first half on a blaze and now find themselves just two games behind the Denver Nuggets for first place. When two players like Boozer and Kaman are so close in terms of numbers, shouldn’t the record of the team they play for have some say in the equation. The NBA All Star Game will attract many viewers because the game’s best players are competing, it’s just unfortunate Josh Smith and Carlos Boozer have to be two of those watching. Here’s the list of unrestricted and restricted free agents for the Packers this season. There are 13 of them, and here I have them listed 1-25, based on who is the most important to re-sign (1) all the way down to players who have no shot at making the club next season (13). Many expected Nick Collins to be in this spot, but the fact that Pickett is unrestricted makes it that much more important that he is re-signed. The defensive line will be an interesting spot in 2010 for the Packers, especially if Pickett leaves. Rookie B.J. Raji had an above average rookie season, but it’d be dangerous to put him as the full-time nose tackle and find a replacement for him. A need the Packers will be looking to address this off-season is outside linebacker. Clay Matthews III supplanted himself as a starter for the next decade with his fantastic rookie campaign, but on the other side the picture is not so clear. Brad Jones put together a solid freshman season, but the jury is out on whether or not he is just a flash in the pan. Brady Poppinga is not a lock to be on the team (though his contract suggests he will), Jeremy Thompson can not stay healthy, and Aaron Kampman is an unrestricted free agent. To take a look at past PER’s or the formula for determining PER, click here. It’s becoming harder every game to find something wrong with Jimmy Butler’s game, who continues to be one of the most efficient players in the Big East and is a front-runner for Most Improved in the Big East. During Marquette’s four-game win streak, Butler has averaged 18.5 points and 7 rebounds, while shooting 55 percent from the field. As the Golden Eagles’ best defender, Butler will have a tough task in front of him with players like Dominique Jones, Jeremy Hazzell, Lance Stephenson, and Gilbert Brown coming up on the schedule. Lazar Hayward might be Marquette’s best player, but there’s no denying the importance of Butler to this Marquette team. Jimmy Butler has been Marquette's most efficient player this season, with a PER over 23. In one of his best performances at Marquette, Hayward led the Golden Eagles to a fantastic road win over Providence by pouring in 28 points and grabbing nine rebounds. There is beginning to be a sense of urgency in Hayward’s game as the 6-foot-6 senior’s days at Marquette are numbered, regardless of whether or not they make the tournament. Marquette will only go as far as Hayward lets them. He has the potential to take over games on offense and shut down taller players on defense, but can also get into foul trouble and fall in love with the three-pointer too much. As long as Hayward is playing well, so will Marquette. Surprised to see Fulce towards the top of this list? Don’t be. The junior from Texas has quietly put together a nice season and has done well in the limited time he has received. He isn’t going to provide a post presence for 30 minutes a game and grab double-digit rebounds, but he has been a great player off the bench who, “surprisingly”, guards bigger than he really is. With such a short bench in the front court due to injuries, Fulce has been an important body to have. He is efficient when he plays, regardless of how short the stints are, and rebounds well per minute. His numbers are inflated because he only plays 11.4 minutes per game, but he still plays well. 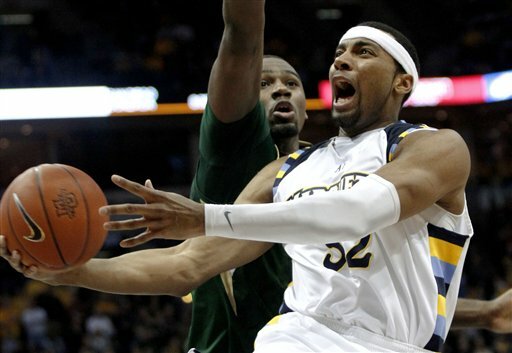 Marquette is experienced in the back court with seniors Maurice Acker and David Cubillan, but it has been Johnson-Odom who has meant the most to the Golden Eagles, supplanting himself as the third best player on the team. The sophomore from Raleigh has proved to be a lethal scorer and his defense is coming along nicely, but still needs improvement. The one thing that makes Marquette such a sleeper team in the NCAA is their ability to shoot so well from beyond the arc. The three-point barrage starts with Johnson-Odom, who is shooting over 50 percent for the season. Teams have learned to respect DJO’s range, which is why his ability to drive and finish at the rim has been so important. No one expected Maurice Acker’s ridiculous three-point averages to stay as high as they were earlier in the season, but Acker has still been an important part of the Golden Eagles’ late run. In a five-game span, Acker hit 16-of-18 three-pointers and put up his career high of 23 in a win over Providence. A senior point guard is one of the most important parts of a team that expects to compete in the NCAA Tournament, and Acker is that guy. He gives up size on defense but he plays stingy, understands Buzz Williams’ system, and runs the fast break better than anyone on the team. Don’t underestimate Acker’s contributions. The New Orleans Saints defeated the Indianapolis Colts Sunday in Super Bowl XLIV, finishing off a memorable season that included many highs, a few lows, and ultimately the Vince Lombardi Trophy. The Saints won 31-17, in a game that was supposed to feature much more scoring than it actually did. As it is every year, there were plays that both defined and changed the game. This was seen even more clearly by the gutsy play-calling of Sean Payton, so here are the top five plays that defined the Saints’ victory over the Colts. While this play might seem as more of a defining moment for the Colts, it also set up the rest of the game for the Saints. Trailing 10-3 and knowing his team was going to have to put big points on the board to defeat Peyton Manning, Sean Payton opted to go for it on fourth and one from the Colts’ one-yard line. Pierre Thomas ran off right tackle but was stuffed before he could find the endzone and the play resulted in a turnover on downs. But the play-call showed that Payton was not going to play scared against the Colts and that, in order to win the game, gutsy decisions needed to take place. It should also be noted that the Saints then held the Colts to a three-and-out, and then ended up putting three points on the board anyways before halftime. In a call I personally disagreed with, Lance Moore’s catch in the endzone was overturned to give the Colts a 24-17 lead in the fourth quarter instead of a 22-17 lead, where a touchdown would have beat them. The call was originally an incomplete pass after a Colts’ defender inadvertently knocked the ball loose from a fully-extended Moore. Regardless of if the call was right or not, the play changed the feel of the game where the Saints knew the best the Colts could do was tie the game up instead of winning it. It ended up not mattering as the Colts would not score the rest of the game, but who knows if Manning would have taken a shot down field had he known he could have won the game with a touchdown? The score changing from a five-point lead to a seven-point lead was crucial. What a fitting number for Garrett Hartley’s career night to come in at. After being the goat in a loss to the lowly Tampa Bay Bucs, in which Hartley missed a potential game-winning field goal, he showed up big time in the Super Bowl and connected on all three of his field goal attempts. In what seemed to be the playoffs from hell for kickers this postseason, Hartley showed poise and composure as he knocked all three field goals right down the pipe to keep the Saints in the game early. He hit from 44, 46, and 47 yards out on the game’s biggest stage, including a last second field goal at the end of the first half. The conditions were less than ideal on the field after rain had hit Miami hard over the week, making his performance even more impressive. In what most people will decide was their defining moment that ultimately sealed the deal for the Saints, Tracy Porter came up with another huge interception that gave the Saints a two-touchdown lead with less than four minutes to play. Two weeks earlier, Porter intercepted Brett Favre at the end of regulation to force overtime against the Vikings. Guarding Reggie Wayne was tough enough, but Porter read the route and stepped right in front of the Manning pass, and then returned it 74 yards for the score. Just as ESPN puts in the sidebars, “it was over when…” Porter intercepted the pass. He will forever go down in Saints’ history as the best closer New Orleans has ever had. This play will forever be known in New Orleans as “the onside kick”. To open the second half, the Saints noticed that Indianapolis was playing more than 10 yards off the ball, making an onside kick a possibility. Thomas Morestead then preceded to pooch the ball perfectly and Hank Baskett failed to come up with it. The Saints would come out with the ball after one of the longest piles ever, and then ended the drive with a touchdown. 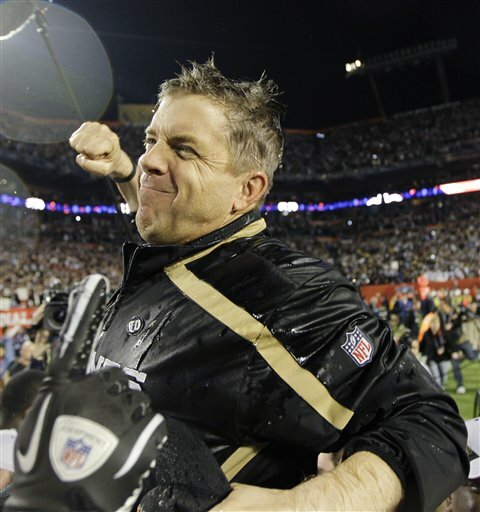 The call from Sean Payton has to be considered one of the gutsiest calls in Super Bowl history. If the Saints do not come up with the ball, Peyton Manning has a four-point lead and 40 yards standing between him and the endzone. Game. Over. Instead, the Saints changed the momentum of the game with the first ever successful onside kick in the Super Bowl prior to the fourth quarter. Porter might have finished off the game for the Saints, but this play will define the Saints for years to come. If you turned the TV off after the game and missed this, go back and watch Brees holding his son after the game and fighting back tears. If you don’t like him or are indifferent to him, there’s no way you can root against Drew Brees in any fashion. It was “heartwarming”, “lump in your throat”, “chills all over”, whatever cliche you want to use. It was all those things and so much more, and I couldn’t be happier for Brees and his family. After starting just 3-for-6 and his team trailing 10-0, Drew Brees regrouped to lead the Saints to a 31-17 victory over the Indianapolis Colts. The real game-changer occurred when cornerback Tracy Porter intercepted Peyton Manning and returned it to put the Saints up two touchdowns with just four minutes to go, but Brees put the Saints up for good by connecting with Jeremy Shockey early in the fourth quarter. 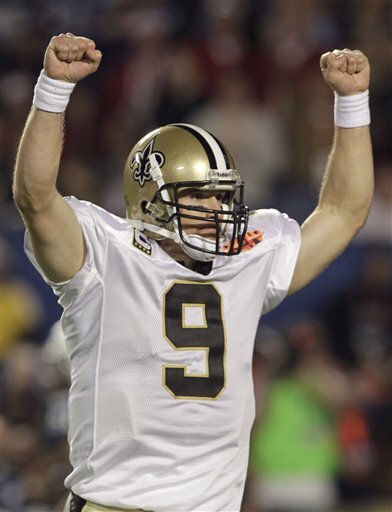 It was the storybook ending for Brees, who led the Saints to the franchise’s first Super Bowl. He finished the game 32-for-39 and threw for 288 yards and two touchdowns. After the game, Brees had one of the more memorable images in recent history, holding his son and fighting back tears. Outside of the Manning-Brees storyline, the biggest headline entering the Super Bowl was the injury status of defensive end Dwight Freeney. The media played it out bigger that it probably was, but Freeney worked hard all week rehabbing and was able to play in the game. He had a relatively large impact despite the outcome, finishing with a sack, a quarterback hit, and a tackle. Brees had his way all game, but let’s not put the blame on Freeney. He used a combination of bull-rushing and his patented spin move to apply pressure and didn’t seem hindered by the ankle. 3. Seahawks LT Jones retiring after 13 seasons? Per his own Twitter page, Seahawks left ackle Walter Jones is retiring after 13 seasons in the league. Sources also say Jones is quite the jokester, so this comment should be taken with a grain of salt. If it’s true, it’s a huge loss for the Seahawks as Jones has been one of the better tackles in the game during his career. 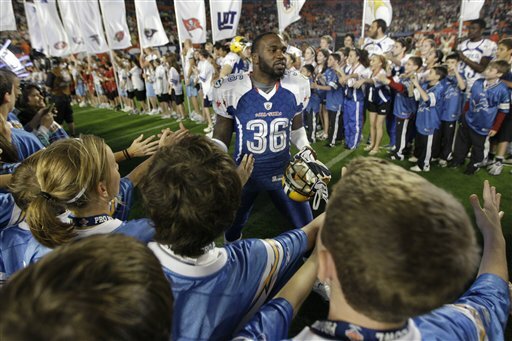 The future Hall of Famer started every game, made nine Pro Bowls, and was a four-time All Pro. Injuries to his knee and back have hampered him over the last couple of seasons, so it might be time for him to hang the cleats up for good. Officially Bryant is questionable because of his ankle, but he is also dealing with multiple injuries and, as badly as he wants to play, sitting out until after the All Star break might be his best bet. The Lakers are in good shape out West and are four and a half games up on the Nuggets, so a break seems like the best bet here. With Pau Gasol, Andrew Bynum, Ron Artest and Derek Fisher available, the Lakers are hardly in a desperation situation without Bryant, and it’s more important that he’s healthy in June. The Blazers continue to receive bad news with their All Star Brandon Roy, as he still does not know when he will be able to return from a hamstring injury that has already cost him 2+ weeks. The Blazers have been hit hard by the injury bug already and are just 4-6 without Roy, but like Byrant his health will be more important down the stretch. Portland is currently sitting in the eighth spot in the West and are fading fast, but Andre Miller, Jerred Bayless, and Steve Blake have been manning the backcourt relatively well. The All Star break should do him some good. After a 39-point barrage in a win against the Lakers, Chauncey Billups missed the Nuggets’ next game because of a sprained ankle. This news is old, but the real story here is that Ty Lawson continued his stellar play in the starting lineup with 25 points and four rebounds in a loss to the Jazz. The leadership isn’t there without Billups and he is playing some of the best basketball of his career, but Lawson has averaged 17 points and six assists in eight games as a starter. 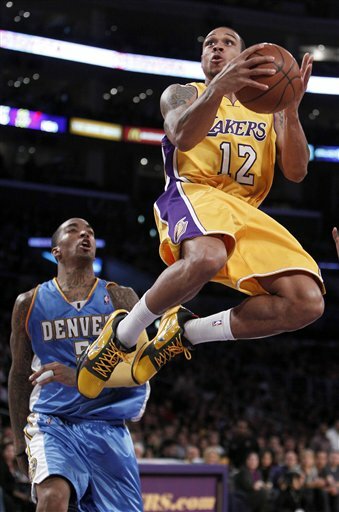 If it weren’t for Billups, Lawson would be in the running for Rookie of the Year. The Nuggets clearly have their point guard of the future. In a no-brainer selection, Jerry Rice and Emmitt Smith were elected to the Hall of Fame this week. Arguably the best at both of their positions, this was more of a “when” than an “if”. Ricky Jackson, Russ Grimm, and John Randle were also elected and were all worthy candidates. Interesting eliminations included Cris Carter, Tim Brown, and Roger Craig, but their days should come soon enough. The Mariners continued their excellent free agency run when they signed Erik Bedard to a one-year, $1.5 million deal. It was great value for Seattle, and incentives could improve the contract to $8 million, so the team will get to gauge Bedard’s performance before they decide on a 2011 mutual option. Bedard has been battling injuries all off-season but his prognosis looks good for the beginning of the 2010 season. He will man the back-end of the rotation in Seattle and could potentially be a steal if he stays healthy. If being the key word there.